This project has been funded by Sanofi who have had no input into any arrangements or content. 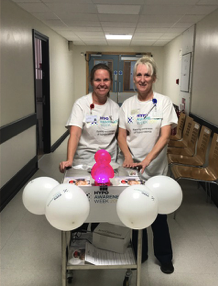 The hospital team documented their campaign using photos and arranged for a fun and educational event to take place every day. T-shirts were worn as they headed to the restaurant where they set up their information stand and posed for their social media photo. They took turns to man the stand, helping to spread the word about recognising and treating hypos. Staff were also encouraged to complete a hypo quiz in exchange for a prize. They packaged up four jelly babies to represent the 20g carbohydrate which can be used to treat a hypo. This gets the attention of people passing by and helped the team to raise awareness. Sticking with the jelly babies they also ran a competition, encouraging people to guess the number of sweets there were in a jar, to add a fun and engaging element to the week. Some of the team also attended a senior nurse meeting to introduce the campaign. Momentum continued to build and they had already managed to attract 91 members of staff to engage in the jelly baby game. They also attended a student nurse forum to teach nurses at the start of their career about the prevention and treatment of hypos. The team head off to the wards and clinics to reach those who had not managed to make it to their stand. They went armed with t-shirts and balloons and handed out jelly babies in exchange for information from interested parties.